Kheer is a very delicious Indian dessert delicacy which is usually served at all occasions. The combination of kheer and Mango makes it even more interesting and increases the taste manifolds. Soak rice for 30 – 40 min. Cook rice in pressure cooker first. Add milk and on medium flame allow the kheer to cook for 2 hours. Keep stirring the kheer occasionally to prevent sticking at bottom of pressure cooker. Once kheer is little thick, add sugar and crushed cardamom and cook for another 30 – 45 mins. Once kheer is ready as per your desired consistency, allow it cool a little and then keep it in fridge for cooling. 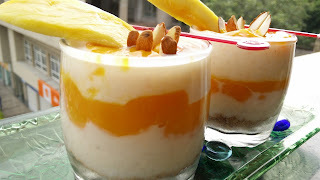 Puree the mangoes and keep it in fridge as well.